Catching fish this time around has been very lacking as matter of fact the only fish we had caught and landed during our offshore passages from New York to the Caribbean and south was a small Atlantic mackerel between St Martin & St Barts, so I thought our luck is changing. We can count all the lures we lost this time and that small mackerel becomes a very expensive meal. 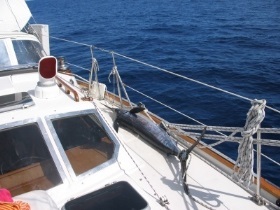 We sailed and fished from St Barts to St Kitts then to Nevis then to Montserrat during which we caught two massive barracudas which we couldn’t eat they are so loaded with ciguatera poison. On the way between Montserrat and Guadalupe we had the two 8” lures one on each side of the boat, one of them with a 400 lb test line. Lillian questioned why such a thick line as it was so hard to coil on the hand reel, I explained that when I bought it I had forgotten what size the old one was, which by the way is a 200 lbs test line, that had served us very well and we still have it. It was a clear hot day, we were motor sailing with full main and genoa making 6 knots on a close reach as the breeze came from the south east. We had taken all the pictures we could of the volcano on Montserrat so Lillian was on deck getting some needed rays and I was in the shade of the cockpit looking aft hoping to snag a fish. Our ETA to Guadalupe was 1430 hours local time. Are we ever going to catch anything? Lillian and I would ask each other, or have all the fish gone? We had lunch and Lillian went back on deck for some more tanning. All of a sudden the cloths peg on the starboard side attached to the 400 lb line snapped. This signals a bite or a strike. I got up to grab the line and started pulling it in but it felt very light as if nothing was on it, so as I usually do, I kept pulling it in to check if the lure is still intact when all of a sudden something yanked it out of my hand. I quickly wrapped it around one of the winches on the coming and started to pull it in when all off a sudden the big Blue Marlin jumps right out of the water about 150 ft to starboard stern. I called Lillian and she came running over when all of a sudden the Marlin jumped out of the water to the other side of the boat. Lillian asked me how we would land such a big fish and I told her that I had already stayed awake many nights figuring that out. For now we had to concentrate on slowing this monster down. One mistake, I asked Lillian to put the engine in neutral, the boat slowed too much now the marlin came towards us and wrapped the line around the wind-vane rudder. The marlin would dive down deep in the ocean, the water was so clear that we could see where it was when below the boat. We tied a 3/8” rope around the hand reel and we managed to unwrap it from around the wind-vane rudder. 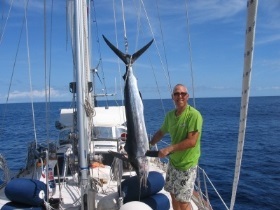 Forty minutes later the marlin started getting tired and I managed to bring it near the boat but every time I go to pull the head out of the water it would wiggle ferociously trying to get loose. We poured some Jonny Walker down its mouth and that put it out. I grabbed it from the long beak and tried to lift it on to the boat but it was too heavy. I devised a way to lasso a rope around the body and pushed it down to the tail tightened it up. The next thing was to attach this to one of the spare halyards, then I took a serrated knife and cut through the mouth to release the hook as it was impossible to remove any other way. 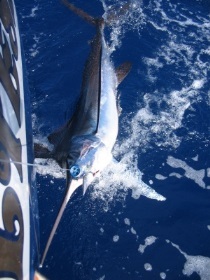 The marlin dropped down into the water, held only by the rope on the halyard, see pictures. We winched it up with the halyard and viola, 1 ¼ hour later it’s on the boat. Then it took me over another hour to clean and cut it all up in stakes.